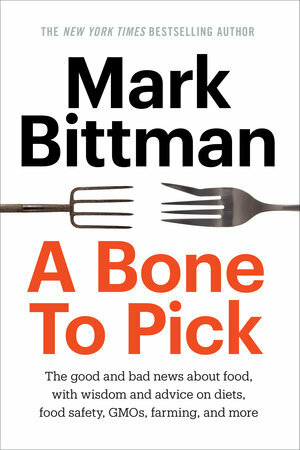 Mark Bittman published a book back in May called A Bone to Pick. Since then, he’s published another book and left the New York Times to work with a new venture, a vegan food delivery service called Purple Carrot. If you didn’t catch his book when it first came out, it’s definitely worth another look. If you read the New York Times regularly, or at least before his departure in September, you’ll know that over the past 5 years, Mark Bittman has become a spokesperson for a more thoughtful way of eating. Over the past century, the large industrial complex of agribusiness has created a food system in this country that in many ways is broken and unhealthy for our population, our food supply, and our environment. Bittman is a proponent for ways that individuals can work to change this system and set it on a healthier course. Though all the pieces in this book have been previously published in the New York Times over the past 5 years, the essays are still timely and relevant. I’ll give you the heads up that this book is not objective reporting. Though research is often cited, Mark Bittman’s essays appeared on the Op-Ed pages of the paper and reflect his strong opinions. I happen to agree with his point-of-view. As a not-so-regular reader of the New York Times who does follow the news about the American and global food system, I appreciated this collection, learned some new things, and found it refreshing to hear the arguments from his voice and perspective. A century ago, most American farms were small family farms growing a variety of crops sustainably and organically. “Big Ag”, including both large-scale agriculture growing monocultures with heavy reliance on pesticides and synthetic fertilizers and factory farms that are frankly inhumane to animals, is relatively new to our world. It’s not too late to (re)introduce more sustainable practices to the largest players in this industry. Given access to fresh real food, each of us can make small changes towards a better food system simply by cooking for ourselves, giving us control over what we eat. In addition to cooking, two more easy steps to improve our own health and the health of our food system are: (1) to eliminate hyper-processed foods, which contain an overabundance of sugar, often in the form of high-fructose corn syrup, from our diets. Regardless of what the marketing tells us, hyper-processed foods are seldom healthy. Eating real food, ingredients that are what they are or can be cooked into what you eat, is much better for you; and (2) to eat more plants. Eating more plants also typically means reducing the animal products, including both meat and dairy, that we eat. Government involvement in publishing objective dietary guidelines that are not influenced by the special interests of Big Ag would go a long way towards improving the health of our population. Frequently changing dietary recommendations have resulted in misconceptions and confusion as well as growing rates in the occurrence of obesity and Type-2 diabetes. Home cooking and eating fresh ingredients can counter these epidemics. Our food system may be broken, but it’s not hopeless. Thought leaders and other organizations are working for change. Those who found reading Michael Pollan’s The Omnivore’s Dilemma to be a life-changing experience might find this book is preaching to a choir they are already part of. Whether you consider yourself in this camp or not, we are all eaters, and I urge you to become a more thoughtful eater. If you’ll pardon the pun, Mark Bittman’s A Bone to Pick provides real Food for Thought to get you started. I received this book from Blogging for Books for this review. The opinions expressed are my own. This week’s recipe for French Fridays with Dorie is a bit of Asian fusion, sort of. Dorie says she was first served this dish, Shrimp and Cellophane Noodles, by her friend Hélène Samuel as part of a dinner of orange food. Interesting… I’ve been wondering which part of the dish is considered orange. The coral of the cooked shrimp or the red of the tomato puree. I’m not sure. Ingredients for this dish spawned a trip to HMart, a gigantic nearby Korean supermarket with a usually large selection of Asian ingredients. Though they have more choices of kimchis and marinated meats for Korean BBQ than I’ve seen anywhere else, their inventory usually includes what’s needed for most Asian cuisines. For some reason, this trip, I was surprised that there was only one choice for tree ear mushrooms and one choice for cellophane noodles. On the bright side, half of the back wall of the store is a fresh fish counter, so I could pick up shrimp and make it a one-stop shop. 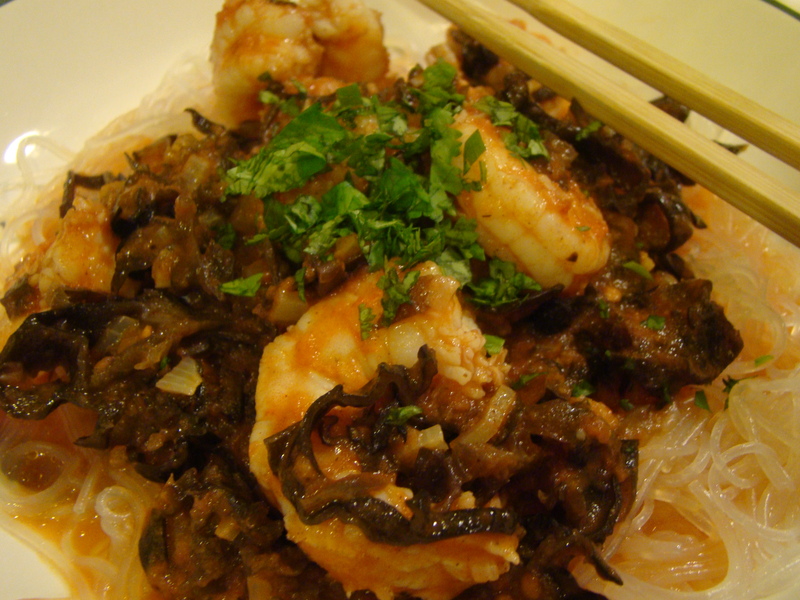 To be fair, this recipe should have been named Shrimp, MUSHROOM, and Cellophane Noodles. 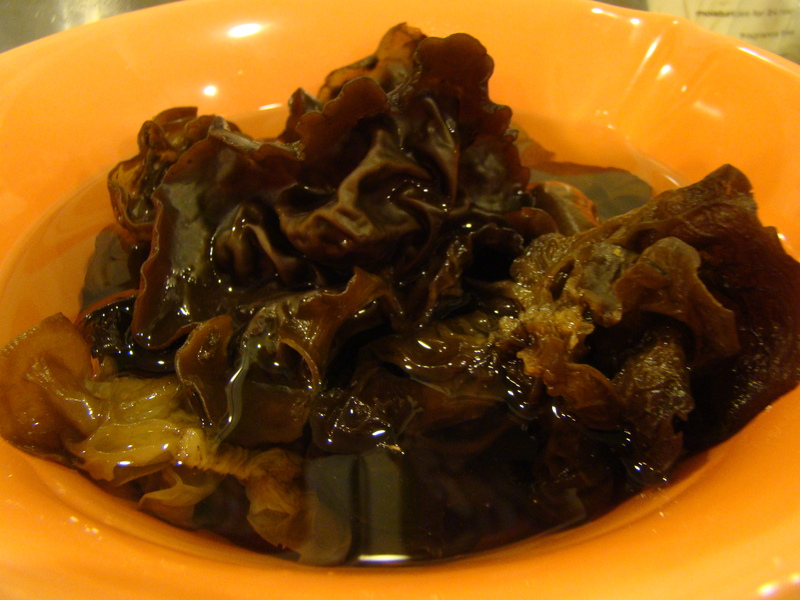 The dried tree ear mushrooms, once rehydrated, were the main ingredient. I couldn’t believe how much the mushrooms, well, mushroomed. The little one ounce pack grew to fill a medium sized bowl with gigantic tree ears. I debated using only half of the mushrooms, once shredded, but ended up using it all. Also, I didn’t understand why the rehydrated noodles were doused in sesame oil and then, shortly before assembling the dish, cooked ever so briefly in the pot of water which simply washed the oil off. I added more sesame oil afterwards, but I wasn’t sure about the purpose this step. Anyone have a clue? Asian ingredients with tomato puree sounded like we were in for a bit of fusion cooking. Unfortunately, the end result was weird. I mentioned the large amount of mushrooms. The dish offered varied textures with the firm shrimp, the slippery noodles, and the dominant shredded mushrooms. I didn’t expect it to taste Italian from tomatoes alone, however, the tomatoes seemed to flatten out the taste completely. There wasn’t any hint of the Asian flavors, even though there was ample sesame oil, five-spice powder, and garlic in there. To Howard, it tasted very sweet, though we couldn’t figure out if that was from the miniscule amount of sugar or the warm spices in the five-spice powder. The consensus at our table was that this dish didn’t quite work. We don’t post the recipes, but you can find it in Dorie Greenspan’s book Around My French Table. To see what other Doristas thought of this recipe, check out their posts here.